The court case against two fisher Leaders examined in Negombo magistrate court today. 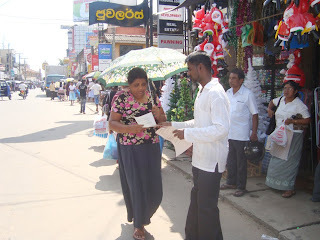 Mr. Marcus Fernando and Mr. Aruna Roshantha were arrested by Negombo Police while they were distributing a leaflet for educating general public on seaplane issue. They were arrested last 28th December 2010 with charges of involving anti government activities as well as provoking people on false facts. According to the above mentioned two charges against them, they appeared before the Negombo magistrate today and they were released on bail with a personal bond amounting to Rs. 200 000 each. The case will be further examined on 31st January 2011. 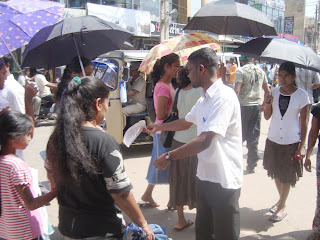 After releasing two fisher leaders, number of fishermen, civil society activists, and catholic priests could be seen distributing a leaflet for educating general public against arresting of fisher leaders around Negombo Town. “We are not afraid of this arresting as we haven’t done any antigovernment activity. We only did educate general public against this destructive sea plane issue and this struggle will continue any further. No one can stop lagoon fishermen. They are strong. Lagoon belongs to us and we need to protect it. ” said Marcus Fernando, chair person of Negombo Lagoon Fishermen Orgnization addressing media after released on bail.